Old industrial architecture is seeing a renaissance not only in the big cities but also in the provinces. Which is what's happening in NorthernItaly where Emilio Colombo with the architects Perrone and Conti turned a recently closed printer's into a new and vibrant space. Industrial archaeology is one the buzzwords of recent years, and when we hear the term what usually comes to mind are those early 20th-century brownfields, huge disused industries or factories in the big cities and their suburbs. But the reality is somewhat different, particularly in northern Italy, where, if we look at the Po River plain, in particular, we find ourselves in a kind of huge metropolitan area, with abandoned industrial and commercial structures everywhere, including prefabricated industrial sheds in the middle of the fields of crops, through to the workshops of small business in the towns and cities. The project by Emilio Colombo with the architects Francesca Perrone and Emiliano Conti fits this context. Indeed, he has turned a printer's, built in the 1980s in the centre of a town in the Pavia wider metropolitan area from a workshop into a home. The philosophy of the project was to keep the large central space, which formerly held the printing press, as the focal point of the refurbishment, breaking it down into three large zones. The other spaces were converted and the architects even managed to create an inner courtyard area. This is the only transparent facade in the whole project, bringing daylight inside all the rooms. To be more specific, this is actually a kind of outdoor zen garden, protected from any prying eyes in the neighbourhood in response to the position of the project in the centre of the town. 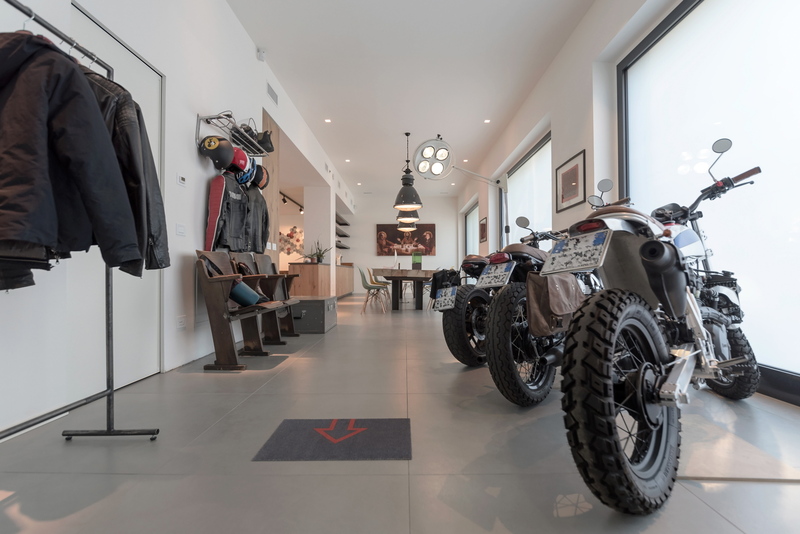 The office area welcomes the occupants with a clear reference both to the architecture's industrial background and to the passions of the owner, naturally encompassing three custom motorbikes that, dropped into this warm, friendly home, turn into modern sculptures. All of this creates an interesting contrast with the focal point of the common area, a large table designed by Emilio Colombo. It was created made using wooden slats obtained from two beams sourced from a 19th-century farmhouse located in the nearby countryside, paired with iron joists. The wood was roughened in the sawmill and finished completely by hand. So, when it comes down to it, this table embodies the philosophy of the project, animated by the desire to reclaim not only the architectural spaces but also traditional materials. So, with its position and large size, we can call this piece of decor a kind of furniture-home that can be used as a kind desk as well as for traditional dining as the centrepiece of family life. The table connects with the kitchen cabinetry, also custom built by an artisan carpenter and clad in American oak. 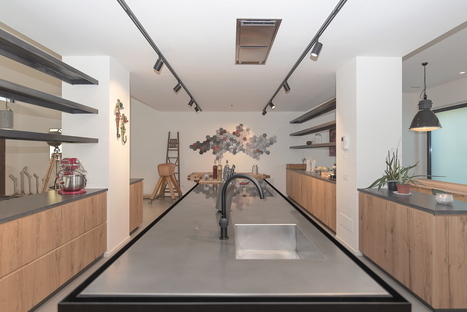 The kitchen benches, on the other hand, are made from folded sheet metal. 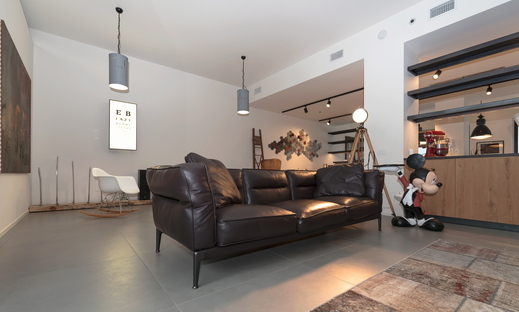 The strong material nature of the open living area is slightly toned down by modern and contemporary design pieces, as well as large fine art paintings that accompany the transition towards the more private rooms. The reclamation of the printer's shows that this kind of intervention in an existing structure is not just the privilege of metropolises because it opens up a myriad of possibilities across the whole of Italy, the Arcipelago Italia, as demonstrated by the research of the architect Mario Cucinella for the Italian pavilion at this year's Architecture Biennale in Venice.